Here we present a protocol for human Dental Pulp Stem Cells isolation and propagation in order to evaluate the prion protein expression during neuronal differentiation process. Martellucci, S., Santacroce, C., Manganelli, V., Santilli, F., Piccoli, L., Cassetta, M., Misasi, R., Sorice, M., Mattei, V. Isolation, Propagation, and Prion Protein Expression During Neuronal Differentiation of Human Dental Pulp Stem Cells. J. Vis. Exp. (145), e59282, doi:10.3791/59282 (2019). Bioethical issues related to the manipulation of embryonic stem cells have hindered advances in the field of medical research. For this reason, it is very important to obtain adult stem cells from different tissues such as adipose, umbilical cord, bone marrow and blood. Among the possible sources, dental pulp is particularly interesting because it is easy to obtain in respect of bioethical considerations. Indeed, human Dental Pulp Stem Cells (hDPSCs) are a type of adult stem cells able to differentiate in neuronal-like cells and can be obtained from the third molar of healthy patients (13-19 ages). In particular, the dental pulp was removed with an excavator, cut into small slices, treated with collagenase IV and cultured in a flask. To induce the neuronal differentiation, hDPSCs were stimulated with EGF/bFGF for 2 weeks. Previously, we have demonstrated that during the differentiation process the content of cellular prion Protein (PrPC) in hDPSCs increased. The cytofluorimetric analysis showed an early expression of PrPC that increased after neuronal differentiation process. 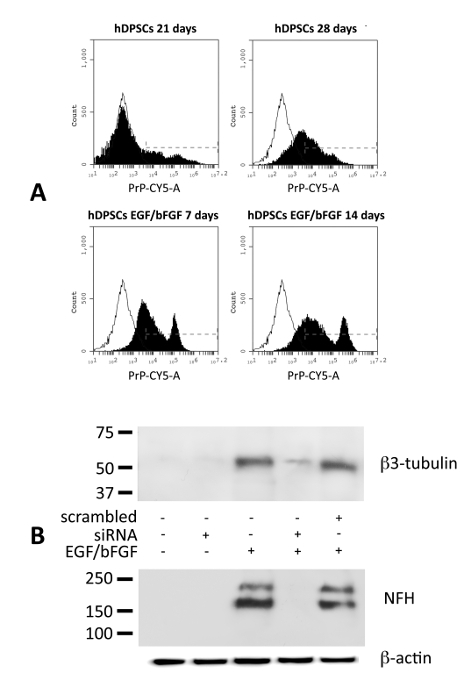 Ablation of PrPC by siRNA PrP prevented neuronal differentiation induced by EGF/bFGF. In this paper, we illustrate that as we enhanced the isolation, separation and in vitro cultivation methods of hDPSCs with several easy procedures, more efficient cell clones were obtained and large-scale expansion of the mesenchymal stem cells (MSCs) was observed. We also show how the hDPSCs, obtained with methods detailed in the protocol, are an excellent experimental model to study the neuronal differentiation process of MSCs and subsequent cellular and molecular processes. Mesenchymal stem cells have been isolated from several tissues, including bone marrow, umbilical cord blood, human dental pulp, adipose tissue, and blood1,2,3,4,5,6. As reported by several authors, hDPSCs show plastic adherence, a typical fibroblast-like morphology. These represent a highly heterogeneous population with distinct clones and differences in proliferative and differentiating capacity7,8. hDPSCs express specific markers for mesenchymal stem cells (i.e. CD44, CD90, CD73, CD105, STRO-1), they are negative for some hematopoietic markers (such as CD14 and CD19) and are capable of in vitro multilineage differentiation9,10,11. Several authors have shown that these cells are able to differentiate into neuron-like cells using different protocols, that include the addition of NGF, bFGF, EGF in combination with the specific media and supplements7,12. Also, many proteins are involved during neuronal differentiation process and, among these, several papers show a relevant role and significant expression of cellular prion protein (PrPC), both in embryonic and adult stem cells13,14. PrPC represents a pleiotropic molecule capable of performing different functions inside cells as copper metabolism, apoptosis, and resistance to oxidative stress15,16,17,18,19,20,21,22. In our previous paper23, we investigated the role of PrPC in the hDPSCs neuronal differentiation process. In fact, hDPSCs express precociously PrPC and, after neuronal differentiation, it was possible to observe an additional increase. Other authors hypothesized a possible role of PrPC in neuronal differentiation processes of stem cells. Indeed, PrPC drives the differentiation of human embryonic stem cells into neurons, oligodendrocytes, and astrocytes24. The purpose of this study was to emphasize the methodology for obtaining stem cells from dental pulp, its differentiation process and the role of PrPC during neuronal differentiation. Third molars used in the study were excised from patients (13-19 years old) with no prior history of drug or alcohol consumption, all non-smoking and with appropriate oral hygiene. On the day of explanation, at the Department of Science Dentistry and Maxillofacial of "Sapienza" University of Rome, informed consent was obtained from the patients or the parents. Informed consent was obtained based on ethical considerations and approval of the ethics committee. Preparation of appropriate medium for the conservation or transportation. Prepare Dulbecco's Modified Eagle's medium low concentration of glucose (DMEM-L) with L-glutamine (494.5 mL). Add 5 mL of penicillin/streptomycin (1%) and 0.5 mL of amphotericin (0.1%). Extract the third molar from the patient, quickly rinse it with PBS, put in a 15 mL test tube with the medium and transfer it to the laboratory in less than 2 h.
Under a biohazard hood, open the tooth with a cutter by coronal cutting pass parallel and tangent through the roof of the pulp chamber. Gently remove the pulp with a small excavator and place it in a test tube. Wash with PBS three times and centrifuge at 2,500 x g for 10 min at RT. Remove the supernatant, resuspend the pellet in Hank's solution and place it in a Petri dish. Incubate for 2 h at 37 °C in 5% CO2. Type IV collagenase solution preparation. Prepare 0.8 mL of DMEM-L. Melt 1 mg of type IV collagenase in 0.8 mL of DMEM-L and vortex for several min. Add DMEM-L up to 1 mL to have a final concentration 1 mg/mL. Filter the solution with a 0.22 µM filter. Remove Hank's solution by centrifugation at 2,500 x g for 10 min at RT and divide the pulp into small slices approximatively 1 mm each one with a disposable scalpel. Place the pulp slices in a petri dish and incubate with 1 mL of type IV collagenase for 15 min at 37 °C in 5% CO2. Medium culture preparation (500 mL). To 445 mL of DMEM-L with L-glutamine. Add 50 mL of Fetal Bovine Serum (FBS) (10%). Add 5 mL of penicillin/streptomycin (1%). Centrifuge the sample at 2,500 x g for 10 min at RT, remove the supernatant, resuspend the pellet in the medium (step 2.5) and culture in T25 flask specific for stem cell at 37 °C in 5% CO2. Every day check the culture and, after 3 days of growth, observe different clones of adherent cells within the flask. Every 3 days change the culture medium. Between 7 and 12 days, once the adherent cells have reach confluence, detach them by treating the cells with 1 mL of trypsin-EDTA for 3 min at 37 °C or gently using a cell scraper. Add 4 ml (ratio 1:5) of the culture medium (step 2.5) to stop trypsin action. Centrifuge the cell suspension for 6 min at 259 x g, remove the supernatant and place the cells in a T25 flask to propagate. NOTE: Every 3 days the cells reach confluence. Propagate the cells up to 21 or 28 days (approximately 6-8 passages) to avoid the presence of non-stem like cells in the culture. Detach the cells with 1 mL of trypsin-EDTA for 3 min at 37 °C or gently scraping. Centrifuge the cell suspension for 6 min at 259 x g.
Remove the supernatant and test the cells for cytofluorimetric analysis (step 6). Culture the hDPSCsin 6-well plates (2 x 105 cell/mL) with 2 mL of culture medium (step 2.5) for 24 h.
The day after, prepare siRNA PrP medium (400 µL). To a sterile test tube, add 384 µL DMEM-L.
Add 1 µL for each type of siRNA PrP to DMEM-L to have a final concentration of 5 nM (4 siRNA PrP were used and verified by the supplier to guarantee a knockdown efficiency ≥70%). Add 12 µL of transfectionreagent to DMEM-L.
Vortex the mixture and incubate for 10 min at RT to allow the formation of transfection complexes. Add 400 μL of siRNA PrP medium to each sample and incubate for 6 h at 37 °C. Without discarding siRNA PrP medium, add 1.6 mL (ratio of 1 to 5) of culture medium (step 2.5). Leave the cells for 72 h at 37 °C. Remove the supernatant and wash 3 times with 2 mL of PBS at RT. Add 2 mL of neuronal culture medium for 7 and/or 14 days (step 5.1). Change the neuronal culture medium every 3 days. NOTE: Replace the siRNA PrP solution each time replace the neuronal culture medium. At end of the time, wash 3 times with 2 mL of PBS at RT and test for neuronal surface antigens by Western Blot analysis. Neuronal culture medium preparation (500 mL). Prepare 444.7 mL of basal media formulated to neuronal cells. To the medium add 50 mL of serum-free supplement used for supporting the long-term viability of embryonic and adult neuronal stem cells (10%). Add 200 µL of basic Fibroblast Growth Factor (bFGF) (final concentration 40 ng/mL) and 100 µL of Epidermal Growth Factor (EGF) to the medium (final concentration 20 ng/mL). Add 5 mL of penicillin/streptomycin (1%) to the medium. Culture hDPSCs in 6-well plates (2 x 105 cell/mL) up to 28 days from the pulp separation and stimulate them with 2 mL of neuronal culture medium. Every 3 days discard the supernatant, wash 3 times with 2 mL of PBS at RT and replace 2 mL of the neuronal culture medium. After 7 and/or 14 days, detach the cells with 1 mL of trypsin-EDTA for 3 min at 37 °C or gently with a scraper. Add 4 mL (ratio 1:5) of culture medium (step 2.5) to stop trypsin action. Test for the presence of neuronal surface antigens (step 6) or prion protein expression (step 7) by flow cytometry analysis. Select mesenchymal stromal (MSC)-specific or neuronal surface antigens. Culture the hDPSCs in 6-well plates (2 x 105 cell/mL) with 2 mL of culture medium (step 2.5). Detach hDPSCs at 28 days from dental pulp separation or after 14 days of neuronal culture medium (step 5.1) with 1 mL of trypsin-EDTA for 3 min at 37 °C or gently scraper. add 4 ml (ratio 1:5) of culture medium (step 2.5) to stop trypsin action and centrifugate at 259 x g for 6 min at RT. Wash another 2 times with 2 mL of PBS at RT. Fix the untreated or treated hDPSCs with 4% paraformaldehyde in PBS for 10 min at 4 °C. Permeabilize hDPSCS with 0.1% (v/v) non-ionic surfactant in PBS for additional 10 min at RT. Perform the blocking with 5% nonfat dried milk in 1 mL of PBS for 1 h at RT. Wash 3 times with 1 mL of PBS and incubate the cells with anti-CD105 (1:100/5 x 105 cells), anti-CD44 (1:100/5 x 105 cells), anti-STRO-1 (1:100/5 x 105 cells), anti-CD90 (1:100/5 x 105 cells), anti-CD73 (1:100/5 x 105 cells), anti β3-Tubulin (1:100/5 x 105 cells), anti-NFH (1:100/5 x 105 cells) and anti-GAP43 (1:100/5 x 105 cells) mAb for 1 h at RT. Wash the cells 3 times with 1 mL of PBS and incubate with anti-mouse PE (1:50/5 x 105 cells) or anti-rabbit CY5 (1:50/5 x 105 cells) mAb for additional 1 h at RT. Use the secondary antibodies for gating the immunopositive cells (anti-mouse PE or anti-rabbit CY5 mAb) and analyze all samples with a Flow cytometer and acquire at least 20,000 events. Culture the hDPSCsin 6-well plates (2 x 105 cell/mL) with 2 mL of culture medium (step 2.5). Detach hDPSCs at 21 and 28 days from dental pulp separation and after 7 and/or 14 days with neuronal culture medium (step 5.1) with 1 mL of trypsin-EDTA and stop the trypsin action as described in step 6.4. Fix the specimens with 4% paraformaldehyde in PBS for 10 min at 4 °C. Permeabilize with 0.1% (v/v) non-ionic surfactantin PBS for 10 min at RT. Remove the supernatant and stain the cells with rabbit anti-PrP mAb EP1802Y (1:50/5 x 105 cells) mAb for 1 h at RT. Incubate with anti-rabbit CY5 (1:50/5 x 105 cells) mAb for additional 1 h at RT. Analyze all samples with a Flow cytometer and acquire at least 20,000 events. The isolation and separation procedures of hDPSCs from dental pulp, obtained from the third molar, are complex processes in which small changes can lead a ruinous result. In this paper, we use the protocol of Arthur et al.12 with several improvements. A representative scheme of procedures is shown in Figure 1.
hDPSCs represents a heterogeneous population of cells with distinct clones and differences in proliferative and differentiating capacity7,8. After pulp separation and seeding of tiny fragments of pulp, we observed clusters of cells expanding on the periphery. Figure 2 shows a small cluster of cells at 1 day (left panel), 4 days (central panel) and 7 days (right panel) from dental pulp separation. Generally, these clusters of cells grow up to reach the confluence approximately between 7 and 12 days. These cells, after neuronal differentiation induced by EGF/bFGF, reduce their growth and, after two weeks it was possible to observe significant changes in the cell morphology and neurites outgrowth (Figure 3). In Figure 4, we show that untreated hDPSCs express multipotent mesenchymal stromal specific surface antigens such as CD44, CD90, CD105, CD73, and STRO-15,9. Otherwise, after appropriate neuronal induction stimuli, hDPSCs express specific neuronal markers such as β3-Tubulin, NFH, and GAP43. hDPSCs, untreated or treated with neuronal induction stimuli, do not express hematopoietic markers such as CD14 and CD19. In Figure 5, we show that hDPSCs express precociously PrPC (21 and 28 days) and, after neuronal differentiation process induced by EGF/bFGF for additional 7 and 14 days, the PrPC content increased (Figure 5A). Since several authors reported that PrPC is involved in the cellular neuronal differentiation, we evaluated the role of endogenous PrPC in this process. Therefore, a small interfering RNA (siRNA PrP) was applied to ablate PrPC and its function. Pretreatment with siRNA for 72 h before EGF/bFGF stimuli for 14 days prevents the expression of neuronal markers B3-tubulin and NHF (Figure 5B). The data show that silencing of PrPC by siRNA affected the neuronal differentiation process of hDPSCs, induced by EGF/bFGF after 2 weeks. Figure 1: Scheme of Dental pulp separation from the third molar. The tooth has been opened with a cutter by coronal cutting pass parallel and tangent through the roof of the pulp chamber and the pulp was gently removed under sterile conditions with a small excavator and placed in a test tube. The pulp, after hank's solution treatment, was cut into slices and treated with collagenase IV for 15 min and propagated in a T25 flask. Please click here to view a larger version of this figure. Figure 2: hDPSCs morphology at different days from dental pulp separation by phase contrast microscope. Morphology of hDPSCs from dental pulp at different days (1, 4, 7) from dental pulp separation. Scale bars = 100 µm. Please click here to view a larger version of this figure. Figure 3: Neurite outgrowth of hDPSCs by phase contrast microscope. Morphology of hDPSCs from dental pulp untreated or treated with EGF/bFGF for 14 days. Scale bars = 100 µm. Please click here to view a larger version of this figure. Figure 4: hDPSCs characterization. Flow cytometry analysis of CD44, CD90, CD105, CD73, STRO-1, CD14, CD19, β3-Tubulin, NFH and GAP43 expression in hDPSCs untreated or treated with EGF/bFGF for 14 days. Histograms represent log fluorescence vs cell number, gated on cell population of a side scatter/forward scatter (SS/FS) histogram. Each panel was compared with the corresponding secondary antibodies as a negative control. A representative experiment among 3 is shown. Please click here to view a larger version of this figure. Figure 5: Role of PrPC during neuronal differentiation of hDSPCs. (A) Cytofluorimetric analysis of PrPC expression untreated (21 and 28 days from dental pulp separation) and after additional 7 and 14 days with neuronal induction media EGF/bFGF. Each panel was compared with the corresponding IgG negative isotype control. A representative experiment among 3 is shown. (B) Western blot analysis of neuronal markers β3-Tubulin and NFH expression (28 days from dental pulp separation) and after additional 14 days with neuronal induction media EGF/bFGF in the presence or absence of siRNA PrP. This figure 5 (A, B) has been modified from "Role of Prion protein-EGFR multimolecular complex during neuronal differentiation of human dental pulp-derived stem cells" 23. Please click here to view a larger version of this figure. In this work, we focused on methodology for isolation and neuronal differentiation of hDPSCs; moreover, we evaluated the role of PrPC in this process. There are several methods to isolate and differentiate hDPSCs in neuron-like cells and critical steps during the process. hDPSCs are able to differentiate in several lineages such as chondroblasts, adipocytes, osteoblasts, and neurons. In our paper, we investigated the mechanisms of neuronal differentiation and the presence of PrPC. As discussed above, these cells express typical mesenchymal stromal-specific surface antigens such as CD44, CD90, CD105, CD73, and STRO-110,25,26. In the protocol, several critical steps can cause the failure of the separation procedure. The first critical step is represented by the choice of patients27. In our experience, we found that increasing age of donors (>20) gradually reduces the ability of proliferation and differentiation of stem cells. In our experiments, we used third molars excised from patients aged 13-19 years old and with no prior history of drug or alcohol consumption, all non-smoking and with appropriate oral hygiene. The second critical step is represented by the choice of the enzyme to separate the cells from the pulp tissue, which could represent the main hot step of stem cells separation procedure. In fact, we realized that a wide use of collagenase I and II, enzymes that can be too aggressive, could damage the cells present in the pulp tissue during the separation process. For this reason, we decided to use collagenase IV because this kind of collagenase as lower tryptic activity than collagenase type I and II. Following exactly the procedure, it is possible to obtain stem cells in 90% of the treated teeth. After the separation, the solution containing hDPSCs is cultured in appropriate flasks until the 6° passage (approximatively 21-28 days) to avoid the presence of non-stem cells in the culture. At 28 days, they were tested for the presence of typical mesenchymal antigens (as referenced above) and used for experiments only when they were positive. In fact, despite the progress made throughout years on hDPSCs, there are still important limitations represented by the extreme heterogeneity of the population. As shown by several authors, there are different cell population types in the dental pulp and, to date, it's unknown what is the best phenotypes able to differentiate into each mesenchymal lineage (chondroblasts, adipoblasts, osteoblasts or neurons). To avoid the current limitations of our and other procedures, the next step will be to select cellular populations with specific phenotypes using specific monoclonal antibodies. In previous work, we showed that PrPC is expressed from hDPSCs. In fact, it is possible to observe a weak positivity at 21 days and an increase of PrPC content at 28 days. Furthermore, we observed that during EGF/bFGF-mediated neuronal induction, PrPC content was further increased. Moreover, we investigated the role of endogenous PrPC in neuronal induction process of hDPSCs. The transient silencing of PrPC prevented the differentiation process of hDPSCs induced by EGF/bFGF23. We fine-tuned and improved the methods of isolation, separation and in vitro cultivation of hDPSCs with simple and versatile procedures. These innovations allow obtaining more efficient cell clones and the large-scale expansion of the mesenchymal stem cells. Also, we suggest that the hDPSCs are an excellent experimental model to study cellular and molecular mechanisms of MSCs neuronal differentiation process. This work was supported by "Fondazione Varrone" and Rieti University Hub "Sabina Universitas" to Vincenzo Mattei. Figure 5 (A, B) reprinted by permission of the publisher Taylor & Francis Ltd from: Role of Prion protein-EGFR multimolecular complex during neuronal differentiation of human dental pulp-derived stem cells. Martellucci, S., Manganelli V., Santacroce C., Santilli F., Piccoli L., Sorice M., Mattei V. Prion. 2018 Mar 4. Taylor & Francis Ltd.
ZEISS Axio Vert.A1 – Inverted Microscope Zeiss 3849000962 ZEISS Axio Vert.A1 provides a unique entry level price and can provide all contrasting techniques, including brightfield, phase contrast, PlasDIC, VAREL, improved Hoffman Modulation Contrast (iHMC), DIC and fluorescence. Incorporate LED illumination for gentle imaging for fluorescently-labeled cells. Axio Vert.A1 is ergonomically designed for routine work and compact enough to sit inside tissue culture hoods. Robey, P. G., Kuznetsov, S. A., Riminucci, M., Bianco, P. Bone marrow stromal cell assays: in vitro and in vivo. Methods in Molecular Biology. 1130, 279-293 (2014). Jiang, Y., et al. Pluripotency of mesenchymal stem cells derived from adult marrow. Nature. 418, 1-49 (2002). Kern, S., Eichler, H., Stoeve, J., Kluter, H., Bieback, K. Comparative analysis of mesenchymal stem cells from bone marrow, umbilical cord blood, or adipose tissue. Stem Cells. 24, 1294-1301 (2006). Zannettino, A. C. W., et al. Multi-potential Human adipose-derived stromal stem cells exhibit a perivascular phenotype in vitro and in vivo. Journal of Cellular Physiology. 214, 413-421 (2008). Mattei, V., et al. Role of lipid rafts in neuronal differentiation of dental pulp-derived stem cells. Experimental Cell Research. 339, 231-240 (2015). Jansen, J., Hanks, S., Thompson, J. M., Dugan, M. J., Akard, L. P. Transplantation of hematopoietic stem cells from the peripheral blood. Journal of Cellular and Molecular Medicine. 9, (1), 37-50 (2005). Young, F. I., et al. Clonal heterogeneity in the neuronal and glial differentiation of dental pulp stem/progenitor cells. Stem Cells International. 2016, 1290561 (2016). Pisciotta, A., et al. Human dental pulp stem cells (hDPSCs): isolation, enrichment and comparative differentiation of two sub-populations. BMC Developmental Biology. 15, 14 (2015). Atari, M., et al. Dental pulp of the third molar: a new source of pluripotent-like stem cells. Journal of Cell Science. 125, 3343-3356 (2012). Koyama, N., Okubo, Y., Nakao, K., Bessho, K. Evaluation of pluripotency in human dental pulp cells. Journal of oral and maxillofacial surgery: official journal of the American Association of Oral and Maxillofacial Surgeons. 67, 501-506 (2009). Gronthos, S., et al. Stem cell properties of human dental pulp stem cells. Journal of Dental Research. 81, 531-535 (2002). Arthur, A., Rychkov, G., Shi, S., Koblar, S. A., Gronthos, S. Adult human dental pulp stem cells differentiate toward functionally active neurons under appropriate environmental cues. Stem Cells. 7, 1787-1795 (2008). Lee, Y. J., Baskakov, I. V. The cellular form of the prion protein is involved in controlling cell cycle dynamics, self-renewal, and the fate of human embryonic stem cell differentiation. Journal of Neurochemistry. 124, 310-322 (2013). Steele, A. D., Emsley, J. G., Ozdinler, P. H., Lindquist, S., Macklis, J. D. Prion protein (PrPc) positively regulates neural precursor proliferation during developmental and adult mammalian neurogenesis. Proceedings of the National Academy of Sciences of the United States of America. 103, 3416-3421 (2006). Wulf, M. A., Senatore, A., Aguzzi, A. The biological function of the cellular prion protein: an update. BMC Biology. 15, 34 (2017). Mattei, V., et al. Recruitment of cellular prion protein to mitochondrial raft-like microdomains contributes to apoptosis execution. Molecular Biology of the Cell. 22, 4842-4853 (2011). Linden, R. The Biological Function of the Prion Protein: A Cell Surface Scaffold of Signaling Modules. Frontiers in Molecular Neuroscience. 10, 77 (2017). Garofalo, T., et al. Role of mitochondrial raft-like microdomains in the regulation of cell apoptosis. Apoptosis. 621-634 (2015). Watt, N. T., et al. Reactive oxygen species-mediated beta-cleavage of the prion protein in the cellular response to oxidative stress. The Journal of Biological Chemistry. 280, 35914-35921 (2005). Mattei, V., et al. Morphine Withdrawal Modifies Prion Protein Expression in Rat Hippocampus. PLoS One. 12, 0169571 (2017). Hu, W., et al. Prion proteins: physiological functions and role in neurological disorders. Journal of the Neurological Sciences. 264, 1-8 (2008). Sorice, M., et al. Trafficking of PrPC to mitochondrial raft-like microdomains during cell apoptosis. Prion. 6, 354-358 (2012). Martellucci, S., et al. Role of Prion protein-EGFR multimolecular complex during neuronal differentiation of human dental pulp-derived stem cells. Prion. 12, (2), 117-126 (2018). Lee, Y. J., Baskokov, I. V. The cellular form of the prion protein guides the differentiation of human embryonic stem cell into neuron-, oligodendrocyte- and astrocyte-committed lineages. Prion. 8, 266-275 (2014). Huang, G. T., Sonoyama, W., Chen, J., Park, S. H. In vitro characterization of human dental pulp cells: various isolation methods and culturing environments. Cell and Tissue Research. 324, 225-236 (2006). Suchanek, J., et al. Dental pulp stem cells and their characterization. Biomedical papers of the Medical Faculty of the University Palacký. 153, Olomouc, Czechoslovakia. 31-35 (2009). Bressan, E., et al. Donor age-related biological properties of human dental pulp stem cells change in nanostructured scaffolds. PLoS One. 7, (11), 49146 (2012).